Whether you’re in the process of forming your team, or you’ve already formed your team, you’ll need to research existing car seat laws—both tribal laws and state laws. To avoid reinventing the wheel, it would be wise to begin your research by determining if your tribal organization has a child passenger seat law already on the books. If there is a law, determine how long ago it was enacted, adopted, or ratified. A law that was enacted recently might not need change. But an older law might no longer meet national standards. This research will also help you determine if your community is using a law created uniquely for it. Some tribes have written their own laws that meet their desired level of enforcement. They might not meet national standards, but they provide a blanket of coverage that is comfortable to the tribe’s population. Other tribes have simply elected to adopt their states code to refer to in adoption resolutions. Once you know whether or not your organization is using a law, then find out whether it is a primary law or secondary law. Primary and secondary laws differ by how a police officer enforces the law. A Primary Law allows an officer to pull over a motorist and give a ticket for failing to use a car seat based on probable cause. The officer doesn’t need to suspect any criminal or illegal activities to pull over the car. An example might be: An officer sees a car pass by with failed child safety seat use. He has the authority to pull over the driver on that basis alone. A Secondary Law Does NOT allow an officer to pull over a motorist and give a ticket for failing to use a car seat. Instead, the driver has to violate another law, like speeding. An Example might be: An officer sees a car pass by with failed car seat use. He does not have the authority to pull over the driver. But if the car is speeding, he can pull over the driver. You need to know whether your reservation’s laws and state’s laws are primary or secondary laws. But state laws may be difficult to enforce on your reservation because of jurisdiction issues. This stems from something called PL 280, which we’ll learn about next. There’s a lot to know about Public Law 83–280, or PL 280. Here is just a brief overview. You can find more information on the Tribal Law and Policy Institute website. PL 280 was enacted in 1953. It shifted federal jurisdiction over offenses involving Tribal members in Tribal Reservations to 16 states. The affected tribes within those states have since faced numerous obstacles in complying with the statute. Since the law was enacted, there’s been a steady stream of uncertainty around jurisdictional authority, and a lack of funding for law enforcement. In states that were affected by PL 280, state law enforcement agencies can take tribal members to state courts for criminal matters within reservation boundaries. But many tribal governments have adopted their own laws and order codes as well, along with the court system to uphold these laws. States do have the authority to surrender, or retrocede, the authority granted by Public Law 280. But tribal governments should be allowed to determine whether and when state jurisdiction should be limited or removed. In states that were not affected by PL280, the tribal police department enforces local laws, with the Bureau of Indian Affairs (BIA) responding to major crimes within the reservation, and murders and kidnappings investigated by the FBI. In short, you should know the jurisdictional makeup of the law enforcement agency on your reservation. This will help you understand how, and if, you can establish a car seat law. (1) Any driver or occupant of a motor vehicle operated on any street or highway of the Warm Springs Indian Reservation shall be properly secured in a seat belt or approved child restraint system that meets Federal Motor Vehicle Safety Standard No. 213. (2) To comply with subsection (1) above, a child passenger who is under four years of age or weighs 40 pounds or less must be properly secured with a child restraint system that meets Federal Motor Vehicle Safety Standard No. 213. (3) The driver of the vehicle will be cited if the occupants in violation of this section are under the age of 16 years. Occupants under the age of 16 years in violation of this section shall not be cited. (4) The offense of failure to use safety belts or child restraint system is a Class D traffic infraction. WSTC 310.600 “Seat Belts and Child Restraints Required” was added to Chapter 310 by Resolution No. 9787, adopted by the Tribal Council on October 11, 1999 and became effective until April 11, 2000. In addition, the Tribal Council indicated that this amendment does not prohibit the riding in the beds of pickups and does not apply to school buses and other vehicles exempt from the seat belt requirements of Oregon state law. See section 6 of this module (11.6) for the Colville experience on drafting a seat belt and child restraint law. Seat Belt Law: All vehicle occupants must be properly restrained in all seating positions. The driver is responsible for properly securing all children under the age of 16. Passengers 16 years of age and older are responsible for themselves and may receive their own citation if they are not properly restrained. Buckling one seat belt around two people or placing the seat belt under the arm or behind the back is dangerous, can cause death or serious injury, and is a violation of the law. Child Passenger Restraint Law: Children under 13 years old are to be transported in the back seat where it is practical to do so. Children must use a child restraint up to their 8th birthday, unless they are 4’9″ (whichever comes first). The restraint system must be used correctly according to the car seat AND vehicle manufacturer’s instructions. Vehicles equipped with lap-only seat belts are exempt from the requirement to use a booster seat for a child weighing more than 40 pounds. Children 8 years of age or at least 4’9″ who wear a seat belt MUST use it correctly (never under the arm or behind the back) or continue to use a child restraint. Always follow the manufacturer’s instructions and guidelines for both the child restraint and the vehicle. Adult violators, 18 and older, are subject to a $10 citation. An adult driver is ticketed for passengers younger than 18 who are not properly restrained. If the driver is younger than 18 and the driver or any occupant younger than 18 fails to wear a seat belt, court costs are added to the fine. The $10 fine and court costs total $51.50. A law enforcement officer can issue a citation solely for a safety restraint violation, but there must be another violation leading to the traffic stop. Child Passenger Restraint Law: Children under age 7 riding in motor vehicles are required to be restrained in an appropriate child safety seat. Violation of the law will result in a $69 fine to the driver. Previously, Idaho’s safety seat law applied only to children up to age 4 and/or 40 pounds. There is no weight restriction on the new law. Idaho is the 29th state to adopt a booster seat law. The purpose of this legislation is to prevent further personal injury and/or death to our young children as they travel our highways. Like Washington, Idaho became a PL 280 state after the initial enactment. While there are no Internet searchable law and order codes for reservations within Idaho, tribes within the state are being proactive about establishing car seat codes. Given the lax nature of the Idaho state car seat law in comparison to surrounding states, Idaho tribes have a unique opportunity to enact car seat laws that approach or exceed National Highway Traffic Safety Administration and American Academy of Pediatrics recommendations. Seat Belt Law: All motor vehicle operators and passengers must be properly secured with a safety belt or safety harness, unless all safety-belt-equipped seating positions are occupied by other persons. This applies to passenger cars, pickup trucks, motor homes, and fee-based people transport carrying 15 or fewer persons. Limited exemptions are allowed under ORS 811.215. Vehicle owners are required to maintain belt systems in working order. Child Passenger Restraint Law: Effective July 1, 2007, child passengers must be restrained in approved child safety seats until they weigh 40 pounds. Infants must ride rear-facing until they reach both 1 year of age and 20 pounds. Children over 40 pounds must use a booster seat to 4’9″ unless they have reached age 8. Since Oregon falls within the PL 280, most the reservations within the state boundaries are subject to state laws, with the exception of the Warm Springs Reservation. When I began my journey to getting a child passenger restraint law adopted by the Colville Confederated Tribes, I knew next to nothing about any car seat laws, let alone laws on reservations. I started off by achieving a baseline understanding of how the state of Washington enforced car seat use. Then, I looked deeper into the Colville Tribe’s law and order code to see if there was anything comparable. The Colville Tribes had passed a blanket adoption of Washington RCW chapter 46.61, which covered car seat use, back in the early 2000s. This adoption of RCW 46.61 made car seat use enforceable by primary action, but the embedded nature of the blanket adoption made enforcement confusing. The interpretation of the law was broad and forced anyone reading the Law and Order Code to search out RCW 46.61 separately to determine the details. 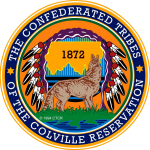 Most law enforcement officers of the Colville Tribes were left to determine the law parameters themselves. The confusing nature of the adoption made the enforcement difficult, so many officers made car seat use enforcement a low priority. My research also concluded that in the past, other individuals had attempted to pass a tribal car seat law specific to the Colville Reservation, but came up short due to lack of business council support. Meetings with the tribal attorney determined that the business council was leery of enforcing anything similar to RCW 46.61, because it was felt that state law was infringing upon the sovereign rights of Colville Tribal members. Meetings with the tribal attorney helped me determine that there was a potential to get a car seat law enforced by fully embracing a law unique to the Colville Confederated Tribes, and specifically eradicating the adoption of the car seat portion of RCW 46.61 from tribal law. The attorney felt that a law written by a tribal member working for a tribal organization might soften the business council to an enforceable and robust primary car seat law. To learn more about what the national recommendations for child passenger restraint safety say, go to the next section.